1Centre for Indian Systems of Medicine Quality Assurance and Standardization Sri Ramachandra University, Chennai, Tamil Nadu, INDIA. 2Faculty of Pharmacy, Sri Ramachandra University, Chennai, Tamil Nadu, INDIA. 3Centre for Regenerative Medicine and Stem Cell Research, Sri Ramachandra University, Chennai, Tamil Nadu, INDIA. 4Department of Periodontology, Sri Ramachandra University, Chennai, Tamil Nadu, INDIA. Objective: In the present study, we examined the effect of Aristolochia bracteolata extract on Human dermal fibroblast (HDF) and Human keratinocyte cell line (HaCaT) proliferation and migration during in vitro wound healing and its underlying mechanism. Method: A. bracteolata was collected and extracted using methanol. Cytotoxiciy effect of plant extract was determined by MTT assay in HDF and HaCaT. In vitro Scratch assay determined the effect of plant extracts on migration of cells and its underlying mechanism was determined by RT-PCR analysis. 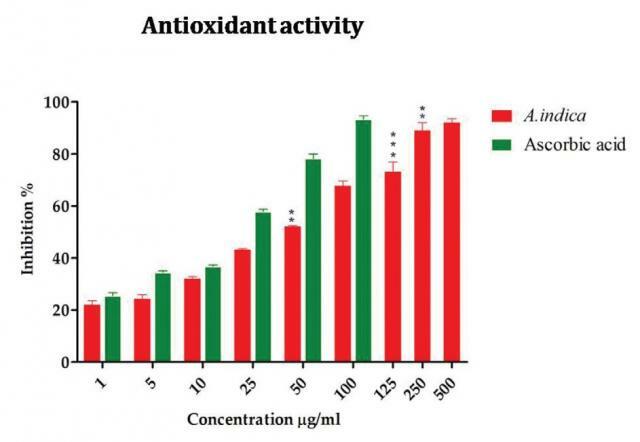 Result: The plant extract of A. bracteolata selectively inhibited proliferation of both the cells at higher concentration (>100 μg/mL) and at lower concentrations (<25 μg/mL), it exhibited linear and dose-dependent cell proliferation. IC50 value was 87.60±1.67 μg/mL for HDF and 85.50±1.65 μg/mL after 24 h treatment. In vitro scratch wound healing studies showed wound closure of 50.38%±1.39 and 69.81%±1.89 at a concentration of 25 μg/mL after 24 h and 48 h, respectively. The extract was tested for anti-inflammatory activity by determination of inhibitory activity on lipopolysaccharide (LPS) induced nitric oxide (NO) production in RAW 264.7 cell lines. We found that A. bracteolata has a strong inhibitory effect on the production of NO and tumor necrosis factor-α (TNF-α). The plant extract of A. bracteolata inhibited inducible nitric oxide synthase (iNOS) gene expression by lipopolysaccharide (LPS). To explore the mechanism responsible for the inhibition of iNOS, gene expression was analyzed by Real- Time PCR. A. bracteolata showed a decrease in the expression of pro-inflammatory cytokine mRNA in a concentration-dependent manner. Treatment with the plant extract resulted in enhanced expression of Collagen 1 a (I) and Collagen IV in HDFs by regulating the mRNA levels of extracellular matrix (ECM) proteins and Matrix metalloproteinase-2. Conclusion: Thus, the present investigation scientifically validates the use of A. bracteolata in wound healing. Girija DM, Kalachaveedu M, Subbarayan R, Jenifer P, Rao SR. Aristolochia bracteolata Enhances Wound Healing in vitro through Anti-inflammatory and Proliferative Effect on Human Dermal Fibroblasts and Keratinocytes. Pharmacognosy Journal. 2017;9(6s):s129-s136.